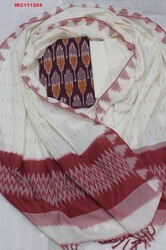 We are a leading Manufacturer of ikat salwar suit, ikkat designer salwar unstitched suit, ikat ladies salwar suit, designer ikkat salwar suit, ikat designer salwar suits and ikkat cotton suits dress material from Hyderabad, India. 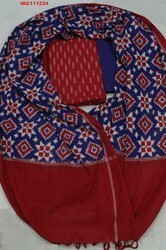 The Suits of Top and Dupatta designed on warp and weft with exactly woven on handlooms with the help of master weaver who has rich experience in weaving, the Dupatta has warp and weft design (Vertica & Horizontal) and the warp and weft has been tied and dyed as per the given design, the warp with the help of comb and weft with the help of shuttle fixed on the looms and the same has been vertically and horizontally woven with exact design setting and matching while weaving on looms. 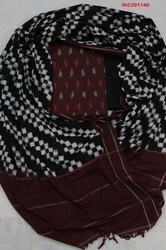 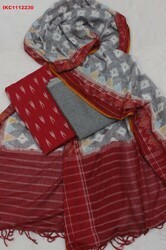 The Ikkat handlooms Salwar Suits, manufactured and woven by using Tie and dye Technique process with ikkat artists who has rich experience in designing and weaving. 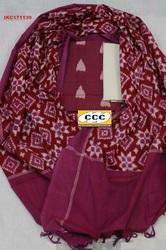 The Ikkat handlooms Code No CCC3173 Salwar Suits, manufactured and woven by using Tie and dye Technique process with ikkat artists who has rich experience in designing and weaving. 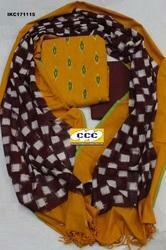 In order to keep pace with never ending demands of clients, our company offers Designer Salwar Suit Material.